San Diego, CA November 17th, 2016 – Luminar, Macphun’s first all-in-one photo editor, is now shipping at macphun.com/luminar. Introducing an ultra-personal approach to photo editing, Luminar adapts to any photographer – from the new shooter to the professional – through its adaptive user interface and personalised digital darkroom concept. Luminar combines power with simplicity and creativity, bringing together over 300 robust tools and features including; personalised workspaces, a range of image correction tools, creative filters, layers & masking, and extensive file import/export capabilities. Luminar is available for a special launch price of $49 for current users of Macphun software, and $59 for all new customers*. A demo version of Luminar can be downloaded at macphun.com/luminar beginning today. Is Luminar an alternative to Aperture? Luminar introduces a wide selection of more powerful and adaptive photo editing tools to fit in with the skills and needs of any type of photographer, alongside an innovation in photo editing software – workspaces, which act as personal digital darkrooms. Currently, Luminar does not have photo asset management features similar to Aperture, but users can plug into Aperture and match up Luminar’s superior editing tools with Aperture’s file library. With updates expected in early 2017, Luminar will soon replace any other photo editor that you currently use. See how Luminar compares to Aperture and Lightroom at macphun.com/luminar/compare. How does Luminar complement Aurora HDR? Aurora’s advanced HDR capability and Luminar’s extensive photo-editing options can be seamlessly combined. Aurora is unbeatable for creating stunning HDR images, and Luminar takes mastering these images to the next level with the introduction of even more editing tools including; filter masking on a single layer, a transform tool, an eraser brush for spot and object removal, and clone & stamp capability. From those small extra tweaks to dramatic edits such as sky replacement, Luminar is the ideal tool to finalise Aurora HDR creations. Find out more about Luminar’s relationship with Aurora at macphun.com/blog/luminar-for-aurora-hdr. Does Luminar complement Creative Kit? Creative Kit is a collection of plug-ins dedicated to specific tasks, whereas Luminar is a universal all-in-one photo editor. Luminar is a combination of the best bits of Creative Kit, all-new capabilities and innovative tools, and a brand new user interface. Find out more about using Creative Kit and Luminar in your editing workflow at macphun.com/blog/luminar-for-creative-kit. Does Luminar support batch processing? Soon! The current version of Luminar does not have built-in batch processing, but this feature will be introduced in the December update, and will be available for free for all current users of Luminar. 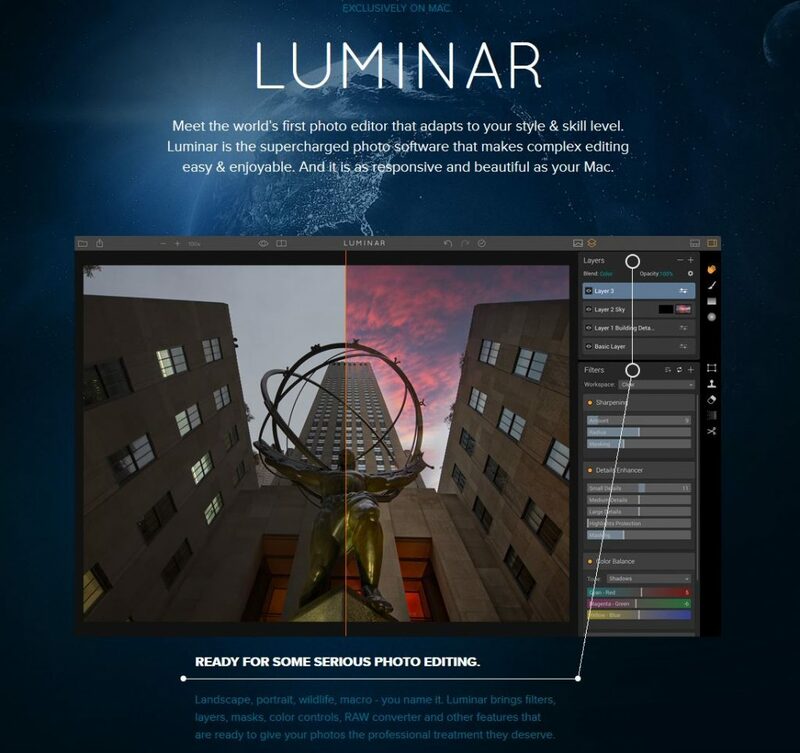 Will there be a Windows version of Luminar? Currently all Macphun software is Mac-only. However, Macphun have started working on the Windows version of Luminar. The plan is to make Luminar for Windows available late Spring 2017. Macphun Software, a leading innovative photography app developer with over 30 million users worldwide, has today announced an update to Aurora HDR Pro. The update will go live on Tuesday May 24th. Macphun Software, a leading innovative photography app developer with over 30 million users worldwide, have today launched a major update to Tonality, their award­winning black and white photo editor for Mac.